The last time China’s GDP growth dipped below 7 percent was in 1990. 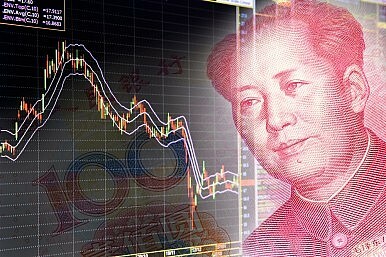 If you eliminate the years 1989 and 1990 as aberrations – China’s economy faced tight sanctions in those years due to fallout over the violent crackdown on protesters in Tiananmen Square in 1989 – you have to go all the way back to 1981 to find a GDP growth rate of below 7 percent (5.1 percent). As Bloomberg News pointed out, 2016 is the first time China has set a range — rather than a set number — for its GDP growth goal since the 1990s. However, it’s not a surprise that China’s leaders have opted for a range given their approach to recent GDP targets. For the past few years, the GDP growth target has been painted as flexible – a “soft” goal that gives China’s economic policymakers a bit more breathing room. In 2015, for example, Premier Li Keqiang set China’s GDP growth target at “around 7 percent” – leaving room for the government to declare the target met even with slightly lower growth (which was exactly what happened, as China’s GDP grew by 6.9 percent last year). The same thing happened in 2014: a “soft” GDP target of 7.5 percent growth, and reported growth of 7.4 percent. In his remarks, Xu acknowledged that China faces economic headwinds — thus the lower growth projection — but insisted that Beijing would be able to keep growth steady. “Now the problems are worse than they were two years ago but the government has the ability to cope,” Reuters quoted Xu as saying. In particular, Xu said that the government would be able to implement its plan to cut industrial overcapacity without causing massive layoffs – and thus impacting China’s sacrosanct priority of social stability. Xu acknowledged that unemployment was likely to rise in provinces that depend on heavy industry, but said there would be policies in place to handle it: “The central government will consider providing policies to help resolve this issue and I believe local governments are fully capable of handling the situation,” Xu said, according to the New York Times. China’s Premier: Our Economy Is Doing Just FineChina's Economy: A Bump in the Road or the End of the Road?China Unveils Economic Strategy for 2016China’s ‘New Normal’ Economy and Social StabilityThe Belt and Road: China's Economic Lifeline?